Who knew that a throw away twitter comment upon learing Paul Azinger was writing a book about Ryder Cup strategy from someone with 130 followers could generate a mini argument about the merit’s of Azinger’s strategy. So, I went back and took a look at how Azinger’s strategy might have affected the outcome of the 2008 Ryder Cup. For those of you that forget, Azinger was widely praised for being some kind of Ryder Cup strategy genius because the US won. I decided to take a look at how much of a genius he is. To do this, I ran three different 2008 Ryder Cup simulations on an adjusted version of the President’s Cup simulation I got from XLSSports. In the first version, we’ll call it Azinger, it has every match-up exactly as how it was done in the 2008 Ryder Cup. In the second version, we’ll call it Captain’s picks I switched out Chad Campbell and J.B. Holmes* with the two highest ranked Americans not already on the team. That would be Ben Crane and Pat Perez. I substituted Ben Crane in every match Campbell played and Perez in every match Holmes played. *Mahan and Stricker were good captain’s picks. Campbell is close enough that there is almost no way to say Azinger is right or wrong. J.B. Holmes was a terrible pick. Finally, I did a third version, we’ll call it mine, I took my four captain’s picks, and aligned them in a strategy that I thought would make the most possible points. I stayed with Crane and Perez as captain’s picks, though if I was actually making the picks I would have selected Steve Marino. *refer to this President’s Cup strategy for the basic idea. First off, I have to give credit where credit is due. 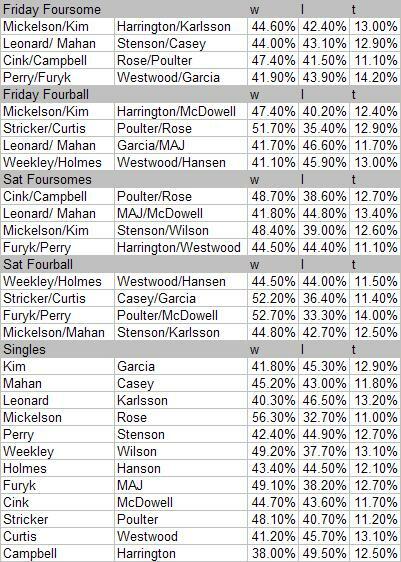 Azinger did a good job with his alternate shot pairings, where your partner does matter. He also limited the use of weak links on the team, J.B. Holmes, Boo Weekley and Chad Campbell as much as could be expected given the popular sentiment after the Euro’s sat there week links for two days then blew it in singles. Another point that should be noted is the Americans were actually a stronger team from top to bottom. I had Sergio and Karlsson as the two best players in this event from 2008, but from top to bottom the Americans were much more talented. Like in the President’s Cup, having two really weak players compared to the rest of the field, is pretty damaging to your chances to win. 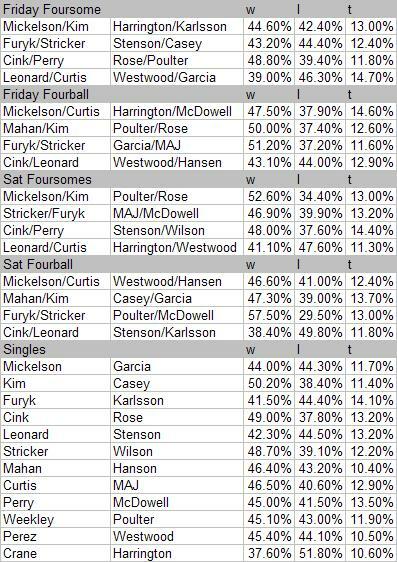 For this reason the simulation I did below for Azinger gives the Americans an almost 54% chance of winning the cup. –Individual matches simulated 1000 times, overall Cup simulated 10,000 times. It’s strange to think now, but even with the “genius” Paul Azinger running this team the Europeans would have flown back with the cup 46 times out of 100. There actually isn’t too big a difference here, because as I said, Azinger only had one really weak link in Holmes and he only played sparingly. Subbing Perez for Campbell is a small improvement, but in reality these guys are pretty similar. Anyway, By putting in the captains picks based solely on my 2008 rankings it does up the US’s chances to around 55%. Not huge, but I’d much rather have 55% of 1 million dollars than 54%. To be fair here, I just used some basic rules. 1/8,2/7,3/6,4/5, were the teams in terms of ranking on the US team I used for all best ball matches. I don’t really see a legit reason to use anyone, but your best 8 in best ball situations, though if you wanted to sub out the 7th and 8th guys, there is almost no drop down to 9 and 10. For alternate shot, I used my knowledge of golf to make good teams. I started from the top of the US team and went down, ensuring that I would use the best players. For singles, I lined the US up 1-12 and sent the off in this order. In each session, I used my teams in an order of strongest to weakest. If I was actually captain I doubt this is how I would do it. There seems to be a strong tendency to put strong teams at the top and bottom of the order, and for the US it would have been incredibly beneficial to try and pair best team with best teams(which would have been basically a coin flip) and then dominate Europe’s weaker teams. To be fair to Azinger, I didn’t do this because knowing the order of the pairings presents an advantage to me that Azinger did not have. As you can see, another small jump up in the US chances to win, with my strategy. After what happened to the Euro’s in 1999, no one is going to take a chance sitting a guy both days anymore, but I definitely think its the best strategy to win. Afterall, a weaker European team had the US on the ropes going into Sunday using it. If Justin Leonard doesn’t make a 50-foot putt, that strategy is thought of in a new light. -It’s hard to say Azinger was an awful captain. However, I see NO proof, or no legitimate reason that he was some great leader worthy of writing a book, like everyone is proclaiming. -Nick Faldo clearly was not thinking right. There is no reason Justin Rose or Oliver Wilson should have seen the light of day before Sunday. That would have increased there chances to win a lot. Paul Azinger certainly did some things well as US Captain. I seriously doubt there was anything important in his strategy other than 12 US guys playing well over a meaningless sample size of 28 matches. I’m certainly not buying his book. Phil Mickelson: Mickelson is hilariously overrated right now because of one tournament. If you want justification that Tiger over Phil at the Masters was a good call, Tiger lost by 5 shots to Phil, looked terrible on the weekend and is still favored by MORE this week. If there was such thing as golf sabermetrics it would be interesting to see a breakdown of Phil’s penalty shots this year. It seems like he took a ton of penalty shots coming into the Masters, then had none(I don’t think) at the Masters. Quail Hollow has much more trouble than Augusta so it should be interesting to see what Phil does this week. Tiger: My rationalization on Tiger is that he has been soundly bashed in Master’s post game and is now more likely to win this week than at Augusta. Part of it has to do with the field involved, which is not as strong, but he’s nowhere near as underrated relatively this week. Kenny Perry: Perry should be an interesting person to follow over the next couple of years, as he arguably had his best years ever at ages 47-49. I’m not sure how fast your skills should be expected to decline, but based on the last two years he is certainly still among the strongest players in the field. Anthony Kim: Generally, I’m pretty optimistic at Kim’s future, but not when he is a past champion, playing incredibly well in the last month and on the back end of a flight back from Korea. Not much important movement in my rankings as most of the big names took off last week, as well as the tournaments that were eliminated from the rolling two year rankings. Seung-yul Noh: Noh had another good finish in Asia, and moved up to right around the average for a PGA Tour player. This is important for two reasons; One, he’s only 17. Two, he has gotten nowhere near the level of attention that Ryo Ishikawa has, but there level of play has been very similar based on a small collection of tournaments from the two. It’s also worth noting that Matteo Manassero has played about half as many rounds as them, but he seems to be on a similar level and is turning pro soon. Sergio Garcia: Sergio Garcia dropped a small amount after another tough showing in New Orleans(about .02 of a shot per round). More noteworthy, his overally poor play so far this season really hasn’t dropped him too much(basically from 5th to 6th). It’s getting hard to defend Sergio because he looks like a mess right now, but you have to remember over the last two years he has still been a very good golfer. Might be back with some live odds Sunday, if I’m around and Tiger/Phil or anyone else(Hurricane Steve) interesting is in contention. I always laugh on ESPN when they say this draft will take a few years before we actually know who the winners and loser are. Then, Kiper and McShay make there snap grades based on nothing but there opinion and fire up there early 2011 mock draft. So, let’s do the sane thing and look back at the 2005 draft. San Francisco 49ers: The 9ers picked Alex Smith(1) and showed why the first pick in an always unenviable position. Smith inked a six year 49 million dollar contract, and has really not produced at all to that level. On his Career, he has a 55% completion percentage and 37 TDs/43 Ints, although he was better last season. Miami Dolphins: Taking a running back early has seemed to fall out of favor the past couple years and Ronnie Brown(2) could be a reason why. When healthy, Brown was good averaging over 4 yards per carry every year with the Dolphins and leading a nice wildcat attack. However, he missed significant time in 2009 and 2007, which cut into his production. Cleveland Browns: There’s definitely a reason why some teams continue to play terribly. Taking Braylon Edwards third and paying him a reported 20 million guaranteed over 5 years is one of those reasons. Not only is Edwards no longer on the team, he was ranked 48th, 77th(below replacement), 24th, and 64th, respectively, in FO’s DYAR for wide recievers the last four years. Not exactly top pick production there. Chicago Bears: Cedric Benson(4) ended up starting only 12 games for the Bears and never rushing for more than 700 yards in a season. He did rush for over 1200 yards last season, but it’s hard to give the Bears credit for that when it came for another team. Tampa Bay: Maybe this year’s class was heavy at different positions, but I’d like to hope the prevailing wisdom is drifting away from taking the flashy skill players in the top-5. Cadillac Williams was the 3rd RB along with a WR and QB taken in the top-5. Williams has struggled with injuries, and really hasn’t been that productive when on the field, so its hard to say this was worth it. This is the danger of picking a RB so high, it seems like these guys are a dime a dozen if you have good parts around them, so why pay them a ton of money on a crapshoot? Minnesota Vikings: It’s safe to say that I would be screaming at my TV that no lineman had been taken yet as the Vikings selected Troy Williamson. I have a hunch will see some good bargains at O-line later. Williamson maxed out at 37 catches in 2006 and never had more than 500 yards recieving for the Vikings. He is currently on the Jaguars, though he only played in 2 games last year. Arizona Cardinals: Antrel Rolle(8) has been a solid contributor to the Arizona defense, playing in at least 15 games since after his rookie season. Arizona has only had a mediocre to bad pass defense in that time, but Rolle does have 12 career interceptions. Washington Redskins: As you can see from the top-7 picks, it’s easy to do worse than take a solid contributor like Carlos Rogers (9) early in the draft. Though he’s never really been anything special, and probably not as good as Rolle, he did start a majority of the games for the Redskins the past two years, which isn’t awful. Detroit Lions: Mike Williams (10). I want to go back and scream at this draft, SOMEONE TAKE A LINEMAN!!! Williams has just 41 more career catches(44) than teams he’s been on(3). On the brightside, this is part of the lineage that led to 0-16, Matt Stafford and Ndamakong Suh. Dallas Cowboys: Demarcus Ware(11). Hey, look, someone listened. Ware has probably been the strongest contributor of the first 11, as he only missed 1 start and has played in all games throughout his 5 year career with 64.5 sacks. Dallas’ defensive line has basically been average for the past 3 years, but there is something to be said for a 5 year contributor for 36 million less than Alex Smith. San Diego Chargers: The Chargers selected Sean Merriman(12) as part of there deal with Eli Manning and Phillip Rivers. Merriman has been less productive in his career than Ware, but he also missed a season due to injury and has been a solid part of the Chargers defense. Can’t argue with that at 12. New Orleans Saints: Finally, a offensive lineman as the Saints took Jamaal Brown 13th. Brown did not play at all last year because of injuries, but started 15 games three times before 2009 and made two pro bowls. I hate to make judgments after 13 picks, but this draft pretty much shows you why there were no QBs, RBs or WRs taken nearly as high this year. The ROI on the lineman was so much higher to this point. Carolina Panthers: Thomas Davis(14) played safety at Georgia, but moved to outside linebacker in the NFL. An injury forced him to miss 9 games last year, but other than that he has been a regular in the Carolina lineup. Kansas City Chiefs: Derrick Johnson(15). Johnson played in most of the Chiefs games from 2005-2009, but his role declined last year as the Chiefs moved to a 3-4. I guess they could have done worse here, but it’s not like Johnson has been anything special. Houston Texans: Houston swapped spots with NO in this draft and ended up taking DT Travis Johnson(16). Johnson was a regular in the Texans lineup before being traded to San Diego in 2009. The Texan’s defensive line was not very good during that time, but I guess he was a not quite the black hole that other teams picked. Cincinnati Bengals: A little bad luck here as David Pollack(17) suffered a major neck injury and is no longer in the NFL. Pollack did okay as a rookie, but never really got the chance to show how good or bad he could be due to the injury. Minnesota Vikings: Erasmus James(18) has to be considered a bust. He has 5 career sacks and is out of the league. He played in 15 games his rookie year, but only 13 since. St. Louis Rams: Alex Barron(19) has played in 60 career games for the Rams in 5 years. He hasn’t exactly been a pro-bowler and the Rams have ranked between below-average and average on the line by FO’s rankings, but again there is something to be said for showing up for 5 years. Dallas Cowboys: The Cowboys took their second defensive lineman of the first round at 20 with Marcus Spears. Spears has had nowhere near the success that DeMarcus Ware has had in the NFL, and the Cowboys defensive line has never been great by FO’s rankings, but it’s not like this is a total whiff. He’s played in all 16 games in 5 years. Jacksonville Jaguars: Taking Matt Jones(21) seemed like a poor idea then. He never played WR in college and in fairness to him, didn’t play it much in the pros. His best year he had 65 catches for over 700 yards, but was out of the NFL last year and now on the Bengals rosters. Baltimore Ravens: It’s like people went a little WR crazy in this draft and the Ravens wanted a WR and had to grab him early with Mark Clayton (22). Clayton had a strong year in 2006, and remains an active contributor to the Ravens, but he’s not exactly a star. Oakland Raiders: The Raiders took Fabian Washington(23) . Washington has started 22/22 games he’s played in the last two years…for the Ravens. He gave Oakland 2 solid years and had 5 interceptions there, but he seems to be nothing special. Green Bay Packers: Remember when Aaron Rodgers(24) sat in the waiting room forever to fall to the Packers? That was 2005. You have to remember when judging this Rodgers did take 3 years on the bench to develop, but has been a top-10 QB with a 63% career completion percentage and 59/21 TD/INT rate. All this for only 5.4 guaranteed up front. Washington Redskins: It’s hard to crucify the Redskins for taking Jason Campbell(25) here. Campbell turned into an average QB, for a lot less money than Alex Smith. If the Redskins made a mistake, it was giving up on him too early when they clearly had other holes that affected his performance. Seattle Seahawks: The Seahawks completed my favorite draft move when the traded down(with Oakland) and took center Chris Spencer(26). Spencer has been a starter for a generally weak unit when healthy. Atlanta Falcons: Roddy White(27) might have gone too high as a WR, but based on what went before him, this shapes up as a pretty good pick. White has three consecutive 1000+ yard receiving seasons. San Diego Chargers: Luis Castillo(28). The Chargers and Cowboys appeared to be ahead of the curve here taking multiple lineman in round 1 and having a lot of success in the following years. He had 7 sacks from the DT position in 2006 and has since declined but remained a regular in the lineup when healthy. Indianapolis Colts: Marlin Jackson(29). Jackson has had injury problems, but had a few good years. Now on the Eagles rosters. Pittsburgh Steelers: Heath Miller (30). Miller hasn’t given the Steelers a ton of production never getting over 800 receiving yards in a season. That being said, he has played a significant amount and remains around the 10th best tight end in the league according to FO. Philadelphia Eagles: Mike Patterson(31) has started all but one game on and Eagles defensive line that Football Outsiders has ranked near the top-10 in each of the last 3 years. Not a surprise that a team like the Eagles that has remained a winning team gets production from the top of their draft. New England Patriots: Taking Logan Mankins(32) was a great pick by Bill Belicheck. He has started all 80 games on the Patriots O-line and he’s been to the pro-bowl twice. Since 2007, the New England offensive line has never been worse than 5th on FO. This kind of production from basically a second rounder is definitely a success for the Patriots. The Patriots were the undoubted winners of this draft, grabbing two starting OL on their undefeated squad and Matt Cassel in the seventh round who turned into a solid QB for them and much more valuable in a trade to KC. Despite their best efforts, Baltimore’s bullpen could not blow another save. The Orioles scored 3 runs in the top of the tenth to take a 7-4 lead, then the bullpen let up 5 hits in the bottom half of the inning, but only 2 men scored and the Orioles held on for the 1-run win. Speaking of terrible bullpens so far. Kyle Kendrick ran up his scoreless innings streak to 12, before falling back to earth with a 5 run 5th. Kelly Johnson and Mark Reynolds each homered off Kendrick for the D-backs, who tacked on three more against the Phillies pen for the victory. The D-backs now lead the league in HR, SLG and are second in OPS. I would have been very skeptical that Nyjer Morgan could score as the Nationals first batter and that would be enough to win the game. In fact, that’s exactly what happened. Scott Olsen gave up no runs through 7 innings with 8 Ks against 1 BB and the bullpen finished off the shutout for the Nats. Justin Masterson had been good coming into yesterday’s start, but allowed 7 runs in 4 innings of work. Obviously, the pathetic Indians offense(worst OPS in AL, only better than Houston in MLB) was not going to come up with enough runs to help out Masterson. Masterson still has a good FIP and his HR/FB ratio is very high early on with a low strand rate, though I would like to see him cut down on the walks. Jose Guillen hit his 7th home run of the season and is now hitting .351/.372/.716 so far this season. The Royals got all 4 runs off Slowey in the first 6 innings then held on, with a scare from Soria, for the win. Today: Cleveland is taking on the historically overrated Angels today, that seems pretty automatic. Atlanta in last place in the NL East and favored over the Cardinals on the road is interesting as well. Hudson has really not been all that good so far, with a 3.38 K/9, 3.38 BB/9, but I expect him to be better, and it’s not like Lohse is that good, either. San Fran might be worth it, considering the hot start that Halladay is off to and the Nationals with Lannan on the hill should be an option against the Cubs. Used the same spreadsheet I had setup for the Masters, just changed the averages to the averages for the last 4 years at TPC Avondale. It should be interesting to see how close this is to what is out there. Number to left is chance of making cut. Then it’s chance to win and odds on the right. * means started second round on back 9. Didn’t get around to wrapping up the 1-5 Wednesday. Andy Marte homered in the fourth inning to put the Indians ahead 3-0 and that was all they would need. As a team, the Indians racked up 11 hits and 20 total bases, which was a little surprising. Mitch Talbot went 6 scoreless innings walking 3 and allowing 2 hits. He now has a 2.25 ERA on the season but a 6/8 K/BB in over 20 innings pitched. Tonight: Two early season stalwarts are taking on pretty good teams this weekend, so that promises to be tons of fun. The Orioles are in Boston and the Royals are hosting Minnesota for the weekend. Cleveland in Oakland and the Dodgers visiting the Nationals could be good options, too. For the Nationals, Luis Atilano is making his major league debut, which is always fun. On the surface, Lester has been pretty terrible this year for the Red So with an 0-2 record and an ERA over 8. However, a low strand rate and high BABIP should settle down a little bit.